Michael: Long black & Pour-over. TCG: What’s the best thing about your job – the one thing that you really love aside from the coffee? Michael: Hospitality = Unpredictable, we never know what is going to be happen almost every single day, there is no fixed pattern! That’s why I LOVE IT! IT’S THE BEST! Michael: Smooth Jazz / R n B.
Michael: Loose leaf teas, just because I like brewing. Michael: Falling in Love with Australian coffee culture, where milk based coffee is more dominant compared with my hometown coffee culture, where black coffee is more popular. Michael: An awesome blueberry and hazelnut muffin, they are best friends. Michael: Double Ristretto ¾ Flat White (Weekdays), Long Black (Weekends). Both are a must to start my day, no special reason for it. Michael: King Kong for sure! We need pure LOVE to make an awesome coffee! I don’t think Godzilla’s got it. Michael: People are more educated about coffee nowadays and are willing to experience different method of brewing and drinking coffee. TCG: If you could make coffee for one other person of your choice (anyone – past or present), who would it be and what coffee would you make them? Michael: My Mom, and it has to be a strong long black. Michael: Barista and latte art competitions, learn more about roasting and build my own coffee franchise empire! Michael: Clovelly Beach, not too crowded and very good for snorkeling. Michael: The barista and the roaster (beans) are like body and soul. One is not better than the other. Both are equally as important to make a great cup of coffee. 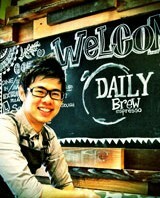 This entry was posted in Barista of the week, Brewsflash and tagged Ashfield, Daily Brew, Michael Lim. Bookmark the permalink. Michael Lim is the King of barista in Sydney!! !